An implant can be cleaned with as much ease as your natural teeth. Dr. Abufaris will perform the implant procedure and your restorative dentist will add the prosthesis. A single tooth implant is the most natural looking way to replace a missing tooth. 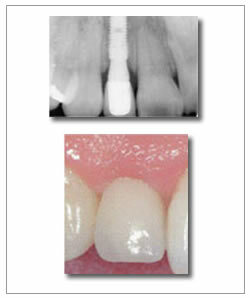 WHY AN IMPLANT VS. A TOOTH SUPPORTED FIXED BRIDGE? A bridge requires the adjacent teeth to be “cut down” to support the cemented bridge. Studies show that 30% of these teeth will require root canal therapy. Also, over a 10-year period, approximately 20% of these bridges fail and need to be replaced, probably due to decay. An implant is not able to develop decay, which eliminates the number one reason for bridge failures. Also, since the bridge is all one piece, it cannot be flossed like natural teeth, requiring that the floss be threaded underneath the false teeth in order to clean the supporting teeth. This usually takes extra effort and for this reason, most people don't clean their bridge, as they should. This increases the possibility of developing decay or periodontal disease, leading to the failure of the bridge. Since the implant is more like a natural tooth, it can be cleaned with as much ease as your natural teeth.